Our 100% solid hardwood single, double, king and super king-size beds are the ideal feature piece in any bedroom and will look beautiful for years. There’s no doubt that the bedroom is centred around that key feature piece: the bed. That's why you need something that will stand the test of time, and look beautiful, year after year. We have designed a selection of more than 20 different beds that will not only match our furniture ranges, but also provide you the highest quality sleeping surface available. 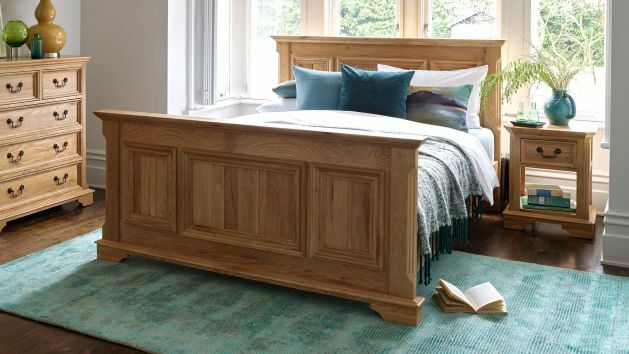 We pride ourselves in using 100% solid hardwood throughout all of our wooden beds, so even the slats are made from solid kiln-dried oak for durability and performance. In fact, all our beds are made of the highest quality hardwoods with each piece being carefully made ensuring durable and beautiful frames, headboards and footboards. We’ve undergone extensive testing to make sure our mattresses and bed frames work well together, knowing that it helps pave the path towards your best sleep. Be sure to also check our range of exclusive high-specification mattresses, designed to specifically complement your new bed frame. And remember that you can also spread the cost of your new dreamy bed with our great finance options, designed to give you flexibility and value. Select from one of our four sizes of beds - single, double, king-size, or super king-size - to get started. And don't forget about our free delivery options, as standard.